Have a green thumb that you want to cultivate but there’s simply no space in your home for a plot of garden? You don’t need a big space for your own little plot to grow plants as small ones are really good and convenient too. You don’t have to spend so much time on it but still get the reward of having beautiful plants growing under your roof. 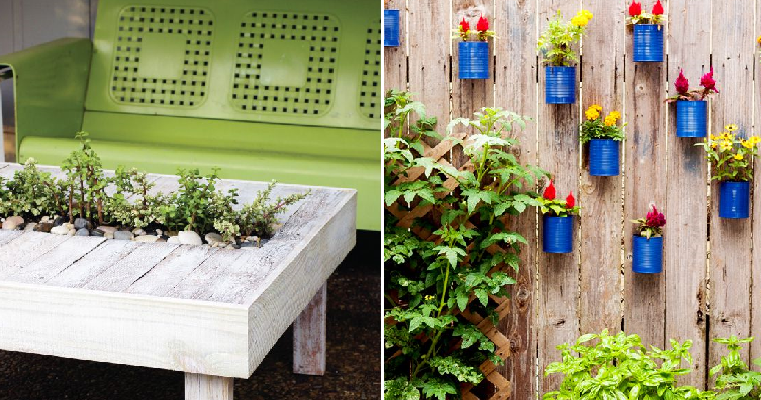 Here are a few ideas for a tiny garden that will make any gardener proud. Using a basic rack, this was transformed into a tiny garden that would delight even the pickiest fairies with its verdant green plants. Plus, there’s even space at the bottom for your gardening tools so everything is within easy reach especially when you need them the most. If there’s no space on the ground for your beautiful plants, then try thinking out of the box and use vertical space instead. The ceiling space is big enough and you can hang multiple pots on them to make sure your flowers and plants have all the attention they need. You know that old pieces of shutters that you have at home just waiting to be thrown away? Don’t do that just yet because you can actually repurpose it and make it into your very own vertical garden. Fill the ample slots with your favourite plants and watch as your tiny garden thrives. If you’re more of a DIY person then this idea is right up your alley. Get out your tools and be prepared to make a stunning looking table or any other piece of furniture into your own little garden like this outdoor table here that has a tiny trough in the middle for your plants. It not only looks unique with the planter but makes a great hangout spot too. Gutters may be traditionally used for rainwater but who says you can’t repurpose them for something else? This cool idea of turning a gutter into a planter and then nailing them up securely on a wall is simply genius as you can save space and tend to your tiny garden easily. Everyone probably has a few old tin cans lying around the house and if you want a mini garden then you can actually repurpose them to make a vertical one. To make it look even better, spray paint them with your favourite colour before nailing them on the wall. 5 Eye-Catching Hanging Planters That Can Be Customized!